I am a 12 year old boy, and from Huddersfield, West Yorkshire. 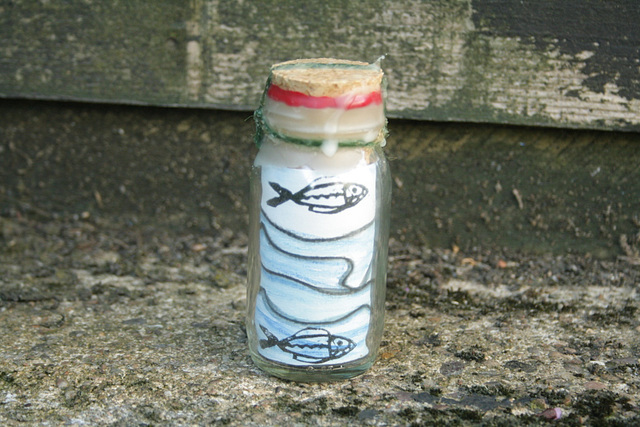 I found your message in a bottle, number 61, in the sea at Mablethorpe near the seal sanctuary, on August the 3rd 2015. I was swimming in the sea with my Dad, I thought it looked like something interesting so I asked my Dad to swim out to it to get for me. I saw it, but it wasn’t obvious what it was straight away. We opened the bottle back at my Grandma’s caravan, and my family and I were touched to see that someone had put loads of effort into making someone else feel happy! The bottle is on my mantlepiece at home, and it gives me happy memories of my holidays. Thank you for the great gift, and I was excited to find it! This email that reached me two days ago (well, in fact it is two messages which I put together here). I am delighted to hear that another bottle has found a happy new owner. 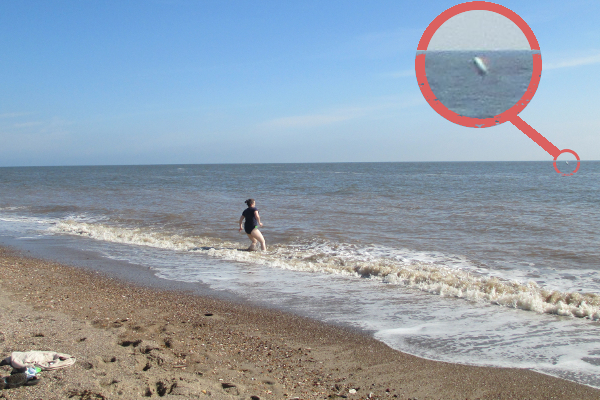 The bottle has been floating for three or four days it seems, back and forth with the tide, and was found on the same beach quite close to where it was dispatched. ich bin ein 12 Jahre alter Junge aus Huddersfield, West Yorkshire. Ich habe die Flaschenpost No. 61 am 3. August im Meer schwimmend bei Mablethorpe gefunden, in der Nähe der Seehundaufzuchtstation. Ich war gerade mit meinem Papa im Wasser, und dachte, dass da etwas interessantes im schwimmt. Ich habe die Flasche gesehen, aber mit war nicht klar, was das sein würde. Ich habe meinen Papa gebeten, es für mich aus dem Wasser zu holen, und so ist er für mich rausgeschwommen. Wir haben die Flasche mit in den Wohnwagen von meiner Oma genommen und dort aufgemacht. Ich und meine Familie waren sehr berührt davon, dass jemand sich so viel Mühe macht, anderen eine Freude zu machen! Die Flasche steht auf meinem Kaminsims zu Hause und erinnert mich an meine schönen Ferien. Ja, also wie du lesen kannst, Flasche nummer 61 ist also gefunden worden. Sie ist anscheinend 3 oder 4 Tage lang im Wasser getrieben und mit den Gezeiten hin- und hergeschwappt. Sie wurde so ziemlich and er gleichen Stelle gefunden, wo sie auch abgeworfen wurde. Viele meiner Flaschen werden von 11-15 Jahre alten Jungs gefunden: Das sind anscheinend die aufmerksamsten Beobachter. Bottle number 61 is one of the five sister bottles with title “I (heart) you”. 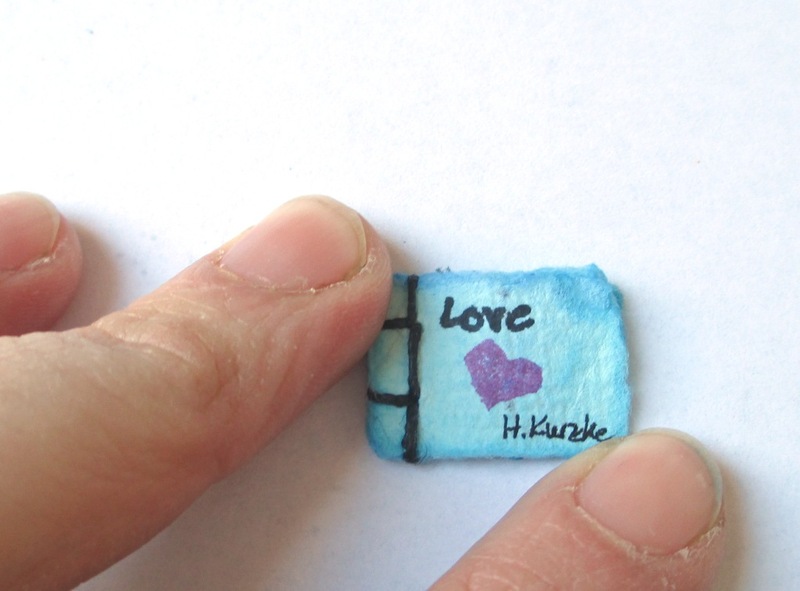 The five miniature books contained are not completely identical, but are all made making use of a couple of stamps which I cut from the erasers at the end of some pencils. 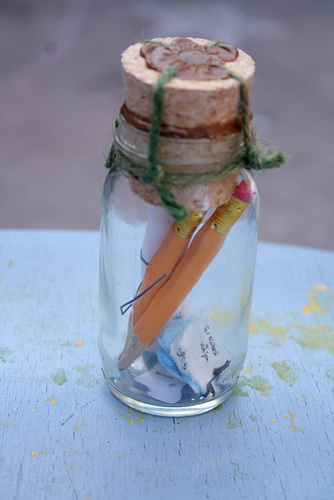 – Andn then I also distributed the pencils among the bottles, of course. 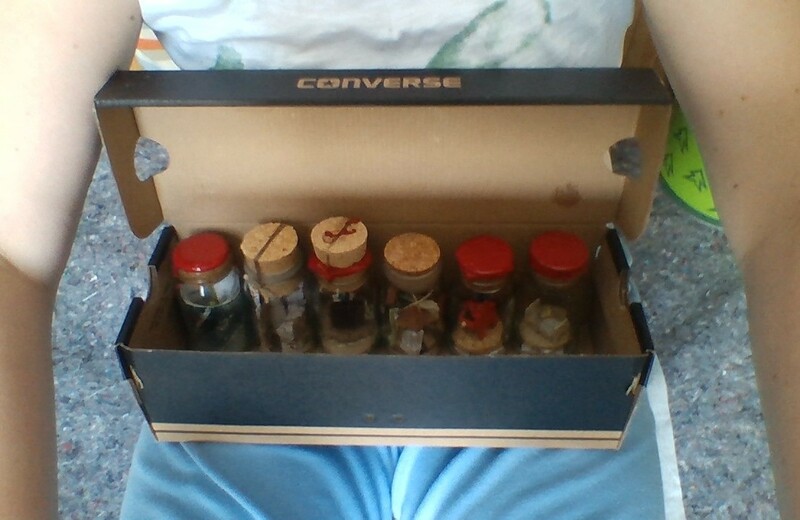 Additionally the bottle contained a letter explaining a little about the project and giving my contact details. 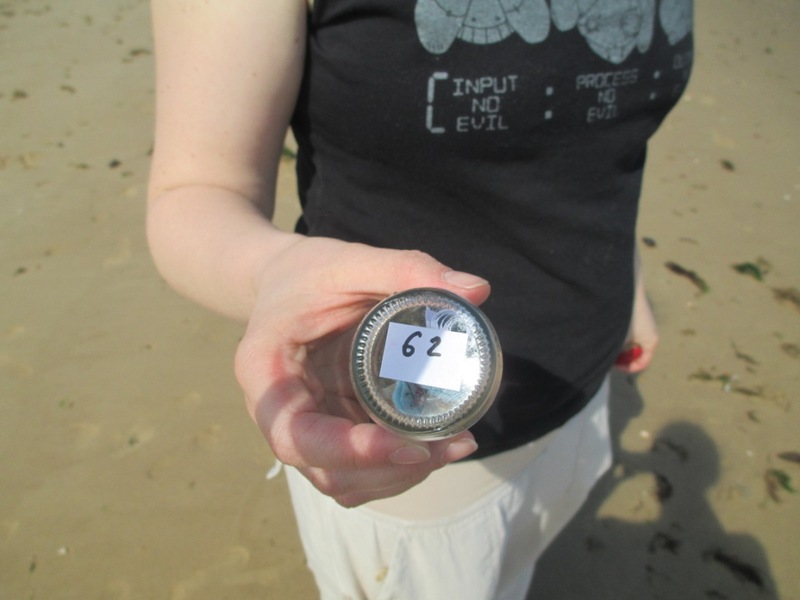 I showed off images of the bottles after bottle number 60 was found in the Saskatchewan river. 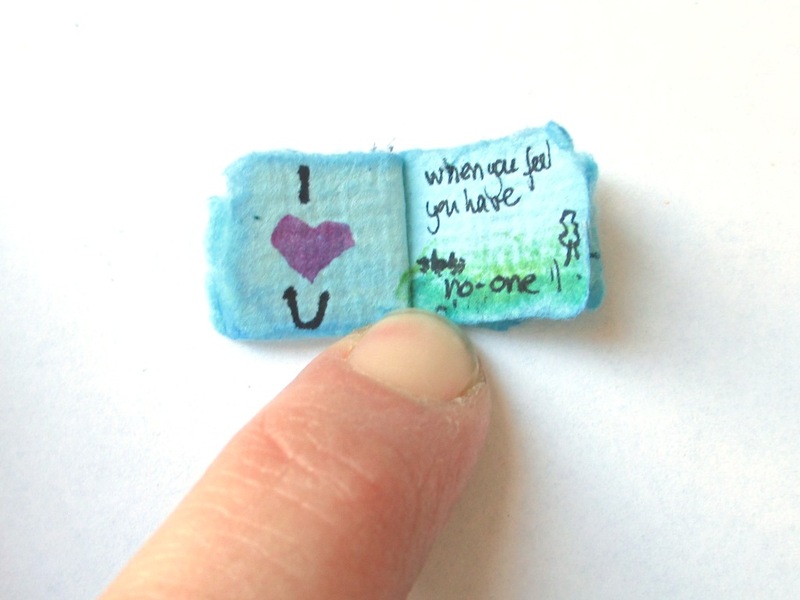 I’ll include them here once again – and add one image showing off another of the inside pages as promised. 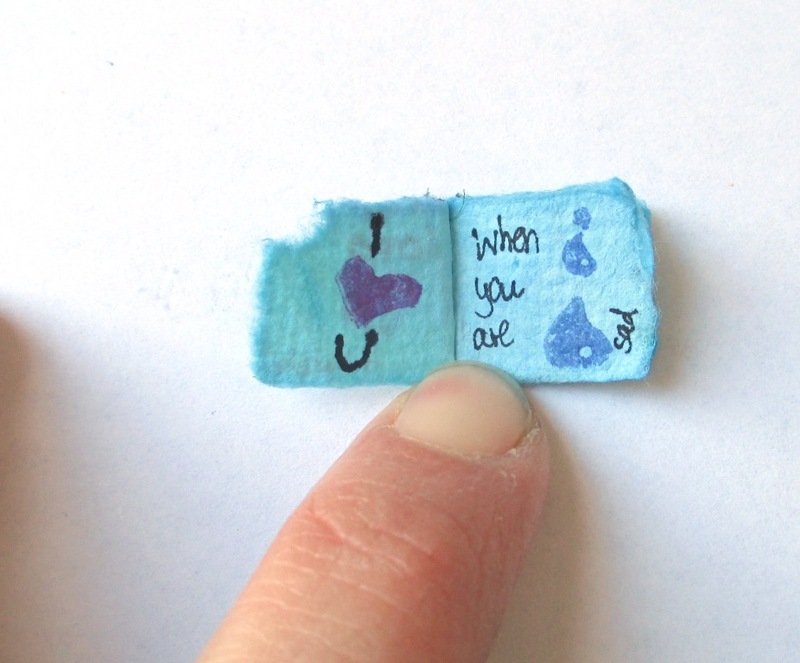 Flasche Nummer 61 ist eine von fünf Schwesterflaschen, die alle ein Minibuch mit dem Titel “I (heart) U” enthalten. Die Büchlein sind nicht 100% identisch, aber alle mit den gleichen Stempeln gemacht, die ich in die Radiergummis am Ende von einigen Bleistiften geschnitten habe. – Die habe ich dann natürlich auch auf die Flaschen verteilt. Thanks to the finder who has shared his story with me and with us! Danke nochmal an den Finder, der mich kontaktiert und seine Geschichte mit uns geteilt hat! We had a big celebration here on Saturday in our house will all our family from Germany visiting, but had arranged everything to go on a brief vacation with my sister and her family for a couple of days, leaving on Sunday. As you might expect, the Saturday and Sunday morning were full of activity and running around. I sat down in the car beside DH, kids in the back, excited to go on a beach vacation with their cousins, heaved a big sigh of relief, and felt ready for vacation indeed. Luckily the drive was not far, a little less than three hours to Wells-Next-The-Sea in North Norfolk. Can you see that brighter yellow strip near the pine forrest there, this is the part of the beach that usually stays dry during high tide. The whole rest is covered in water. 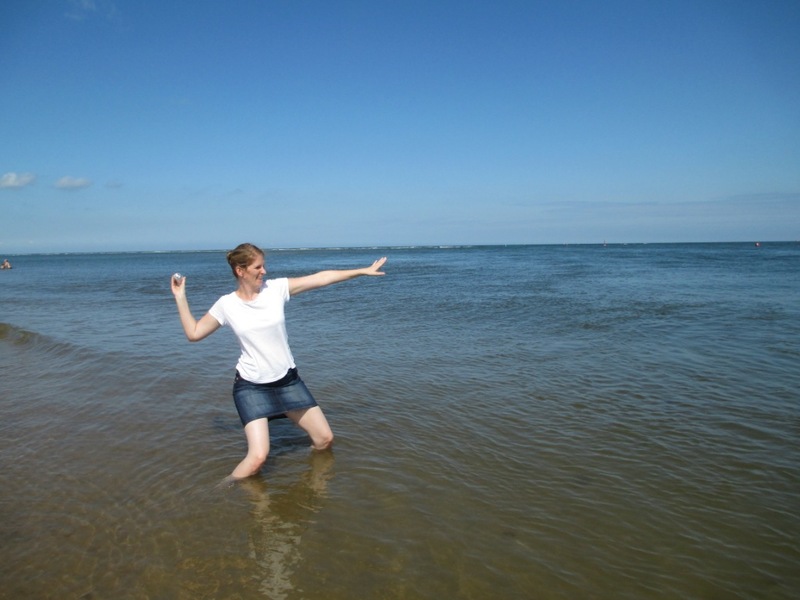 The water then retreats fast, but there is a stream that remains full of water also during low tide. I am not sure whether this is a river in the sense that it carries sweet water. But there are several springs in and around wells (hence the name) and it might be that it is a “real” river. 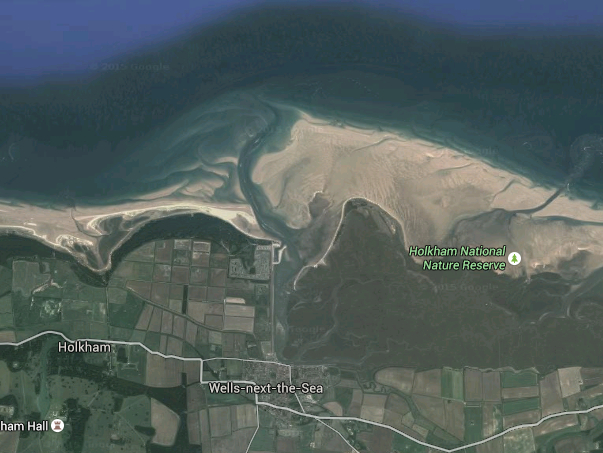 However, looking at google maps it seems to be connected to the sea at several points, and the tide definitely pushes in mightilty. So I am not sure. and number 71 right after. It is funny how fast bottles goe seperate ways after having been tossed in at essentially the same time and the same spot. Bottle number 69 was found right after being put into the water. I have not heard anything about the other one. Two days later. 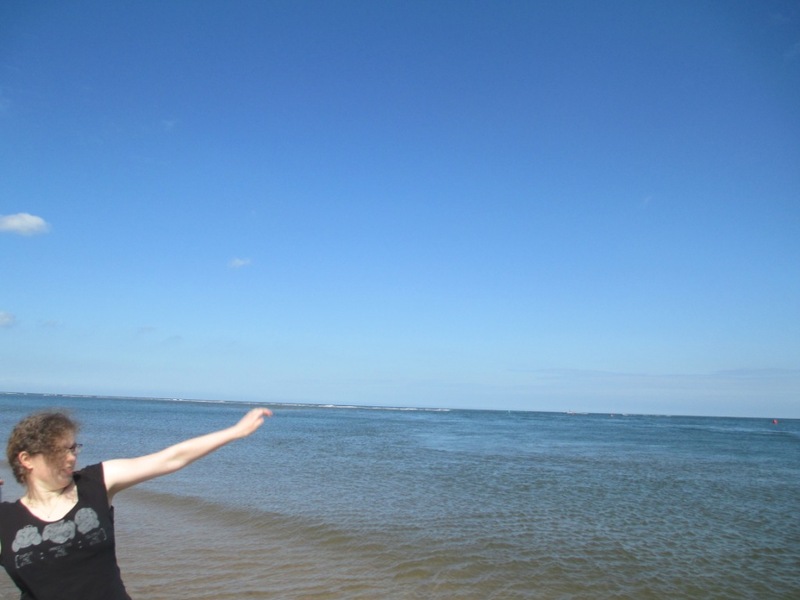 I went to the beach myself. 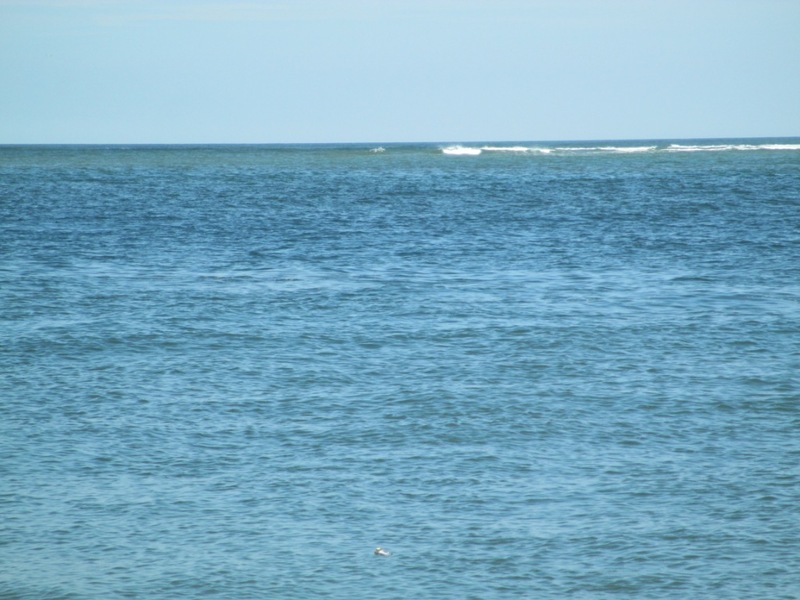 This time the water just started to retreat – ideal conditions. I make one photo of the number before putting in bottles to know later which bottle relates to which image. 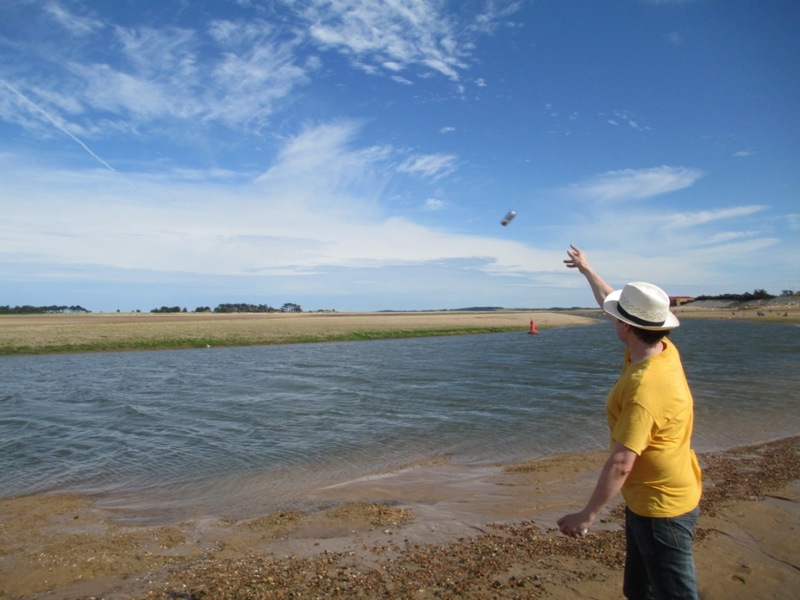 My sister and I took turns throwing in bottles which were caught by the falling tide and the current that would later be the river and drifted quickly out to sea. You can see the buoys in the photos, marking the waterway to Wells harbour for ships. Although the bottles drifted away quickly, we could follow them with our eyes for a while, drifting past two smaller boats. The beach was well visited and I feared someone might take the bottles out right after me tossing it in. But at least those four could only have been retrieved from the beach at hight risk, given the speed with which they drifted out to sea. We looked for a less visited corner, and indeed it looked like no-one watched us throwing. And also the people on the boat didn’t seem to notice the floating bottles. 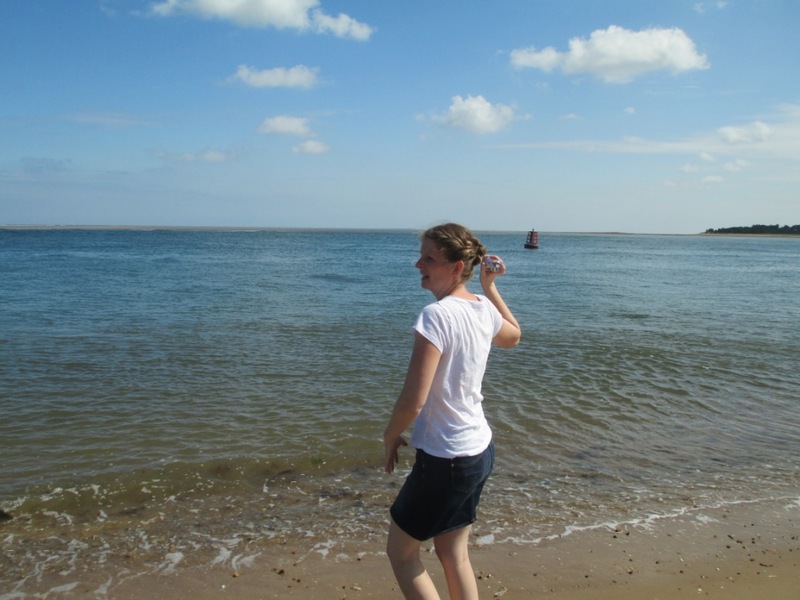 On our way home on Thursday, we took a break to look at King’s Lynn, where the river Ouse flows into the sea. Unfortunately I didn’t have any more bottles on me. M. was surprised that I put in 4 bottles on Wednesday, but my sister and I had just too much fun tossing the bottles to not to. I wish I had brough more. 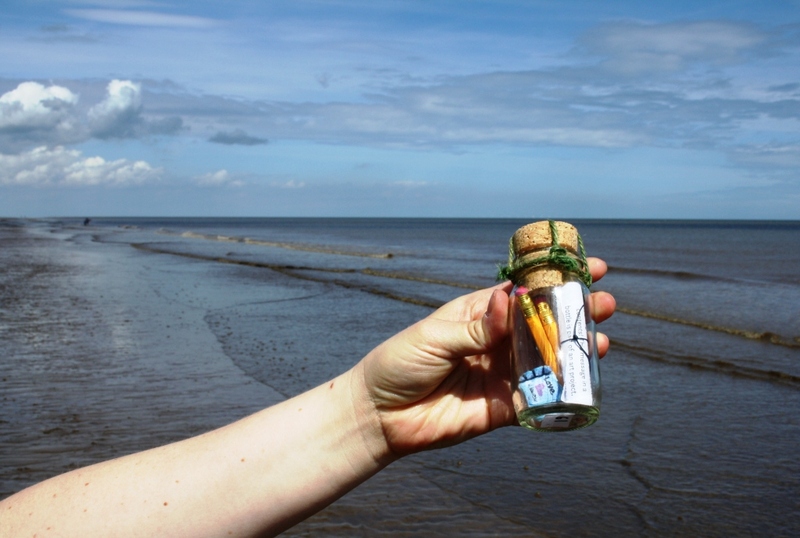 I found your little message in the bottle at Wells-next-to-sea’s beach on Monday the 17th of August 2015. I was really surprised to find it floating around in the sea. I was just wondering where did you drop the message in from? my number for the bottle is 69. Of course I already wrote back, gave him some details and asked for more. How did he find it? Was it hard to spot? Easy to open? Everything dry? And who is he? Was he on a vacation? Where is he from? – I hope he’ll answer my email. If he does, I’ll let you know of course. 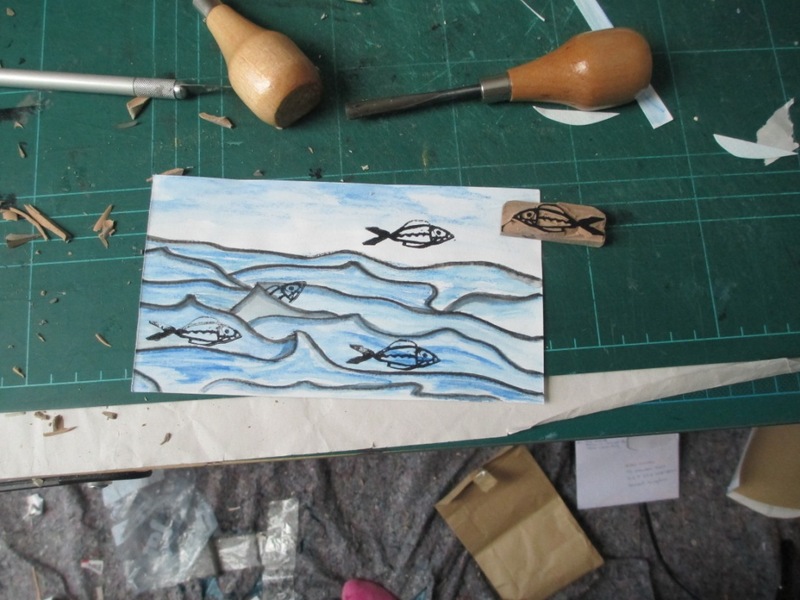 I named bottle number 69 “jumpping fish”, and as usual for these bottles, I cut the stamp for the fish by hand, and put the stamp in as a gift. I just came back from a short break on the English East Coast. Of course I took some (two) bottles with me. This was the first time I dispatched bottles directly into the sea from the beach, and I am not sure whether I was being too clever, maybe. The first bottle was dispatched on July 15 in Skegness. A typical English seaside town with so called attractions like fun rides and casinos and the like. 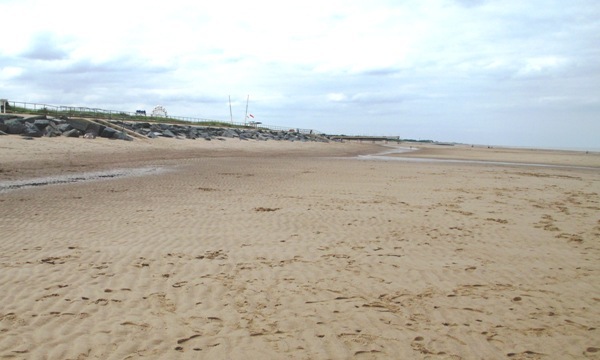 The central beach was still rather empty when we visited, which was probably due to the mixed weather but also due to the summer school holidays not having started yet. The photo above is taken where and when I left the bottle. You can see a Ferris wheel in the background and the Skegness Pier. The tide was low when we visited with the flood coming in. Not a good time for simply throwing a bottle into the water, I figured. And so I decided to partially bury it. – I hope the flood took it with it rather than digging it in even deeper. To be fair, the image above does not show the bottle how I left it. – My own children dug it out a moment later, and so I placed it a little nearer to the waterline and not straight down like here but tilted slightly toward the open see. – I am curious to see whether I will hear anything from that bottle ever again! 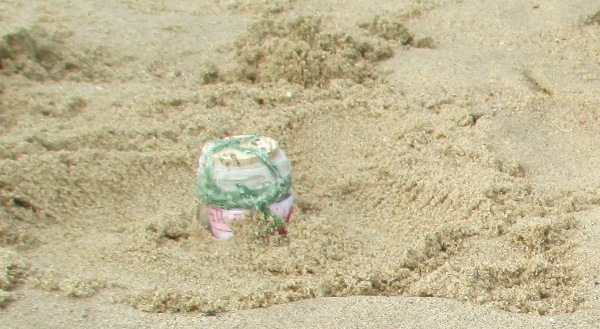 The second bottle went in at a beach near Chapel Saint Leonards. The tide was high and the water was retreating, and so I simply threw it in from the beach. Well, “simply” maybe is not quite right. On a first trial I threw the bottle in standing beside the water and, being not that good at throwing any objects, it dropped pretty short. 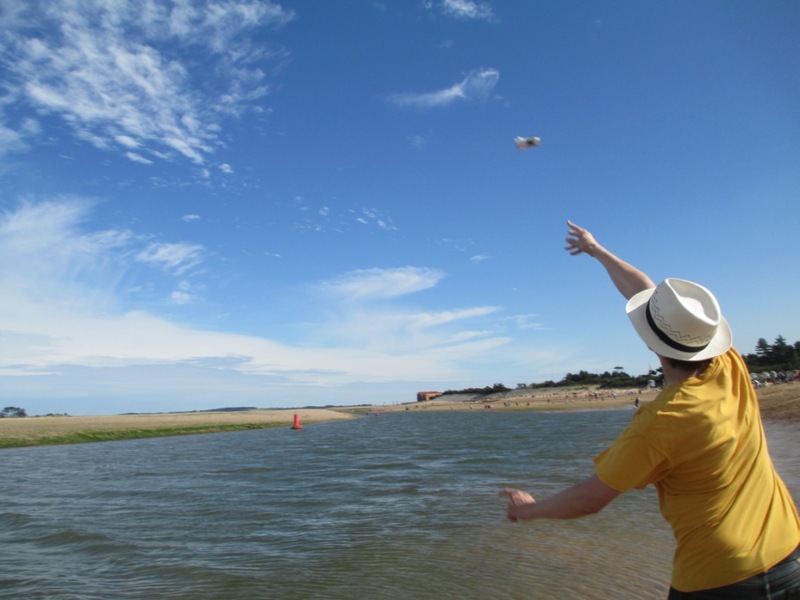 So I quickly got into the water, caught it, and threw it once more. I turned around to get back to my pants, and when I looked again I had already lost sight of the bottle.